The initial cost of growing grass from seed is less than the expense of purchasing and laying sod. Producing a lush green lawn from seed can be satisfying, just as growing vegetables or flowers gives the gardener a feeling of accomplishment. Growing grass from seed requires care and attention to ensure the grass sprouts, establishes roots and grows in evenly. The critical concern after planting grass seed is to keep the area moist. Seeds that dry out will not sprout and a second planting of seed will have to be done. Choose the right time to plant. The ideal conditions for planting grass seed are times of the year with warm, but not hot, days. Planting in mid-summer can be difficult because the seeds dry out too quickly. In northern climates, late summer is a favorable time to plant. In extremely warm regions such as the desert southwest, rye grass seed is planted as late as mid-October. Soil preparation. Turn the soil thoroughly. Break up compaction so the soil is loose and air can reach the roots of the grass. Go down to a depth of at least 6 inches. Take out rocks or other debris that could interfere with establishing healthy turf. Add nutrients. Add compost to increase the nutrient level of the soil. Work the compost deep into the soil. Don’t just spread it as a top layer. Work in a fertilizer with the three essential nutrients for turf grass, nitrogen, potassium and phosphorous. Level the planting bed. Use a rake to smooth out any uneven sections of the area. Water can build up in depressions in the ground, flooding the seeds. Spread the seeds. Use a push spreader rather than sowing the seed by hand. Cover the area evenly with seed by pushing the spreader across one direction, and then across the other direction, like a checkerboard pattern. Gently rake the seeds into the soil. Cover the seeds. Add a very thin layer of compost on top of the seeds. This is done to keep moisture on the seeds. Don’t put a heavy mulch down, which makes it more difficult for the grass to emerge. Maintain a watering schedule. Short, light watering should be done as often as three or four times a day after planting. Keep an eye on the area and see if it is drying out. You may have to water even more frequently in a hot climate. Never put so much water on the seeds that you wash them out of position. Your lawn will have an uneven appearance. Birds love grass seed, and inevitably flock to a freshly planted lawn. Spread about 10 percent more seed than the directions on the seed package recommend to take into account birds consuming some. Keep seed on hand to quickly re-plant areas that sprout unevenly while the weather is still optimal. Keep foot traffic to a minimum after the lawn germinates. 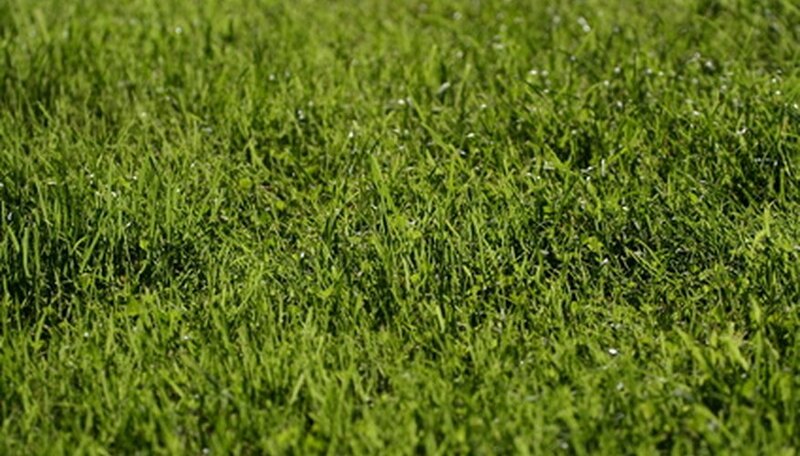 The grass may appear to be thick but it is still tender and can be damaged by people walking or dogs running through it. Wait until the grass is 2 inches in height before mowing it.